For those who appreciate wisteria and sunshine, this is for you. I don’t know why but the month of April takes me by surprise every year. For me it almost marks the start of the year. 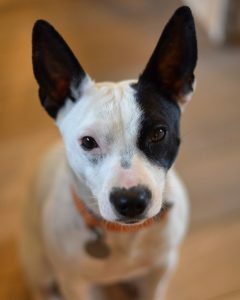 Things happen – the whole valley and hillside turns a vivid shade of green; tulips and fritillaries grow almost as you watch them; the small dog starts to prance with her front paws pointed; and then there’s the light, almost as good as the soft golden autumn light filtering in through the windows at 6 every morning making me eager to get up, make tea and go outside to listen to the early morning stillness punctuated by birdsong. 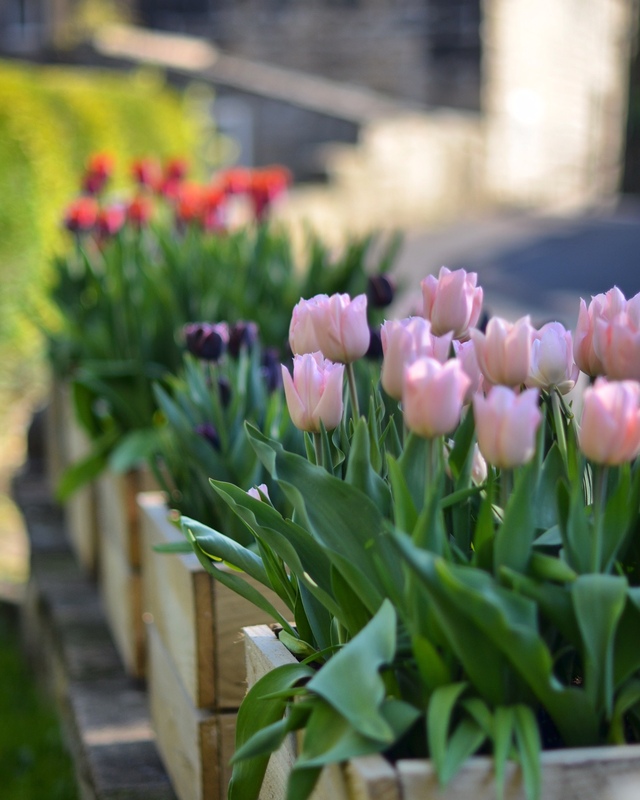 Whilst the colder months have been spent planning, doing/not doing all those indoor jobs and recharging the batteries, April is definitely the month for galvanisation. 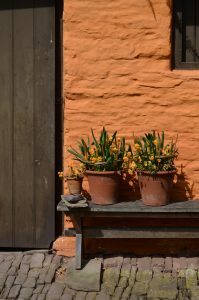 Seeds are sown, the dahlias are thrust into large pots of nutritious earth to wake them up, and out comes the Dove Cottage catalogue so that new plants can be ordered. This year we have so many new courses planned and my mind is a constant whirr. It’s a special year for Mrs B, as her daughter is to be married in a swish London venue and, whilst she is occupied with sartorial issues, I am more excited by the thought that the new rose ‘allotment’ in our neighbour’s field might provide a few exquisite blooms for Kate. It’s no secret that I like to read. There are two piles of books by the bed and more around the house and the new book club from Claire of Honeysuckle and Hilda is perfectly timed. The Enchanted April by Elizabeth Von Arnim is this month’s title. Very oddly, I feel as though I have had a similar month of enchantment and each night, as I finish another chapter and leave the ladies at tea in their Italian castle by the sea, I reflect upon how every April there really are magical moments of light and growth. 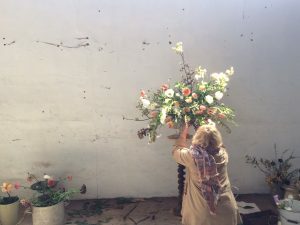 One April there was The Little Flower School, where in a London courtyard bathed in sunshine I learnt the art of the big urn from those floral greats Sarah Ryhanen and Nicolette Owen. Everyone I shared that time with has gone on to become English or Scottish floral ‘royalty’ and I’ll never forget the wise words of Thomas Broom as I left – “Get on Instagram darling”. Prescient as ever. 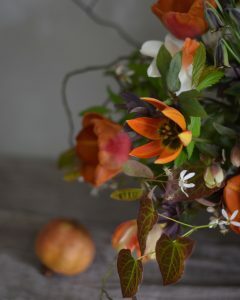 Last April, with fellow Little Flower School disciple Rachael of Hedgerow, we did our floral ‘never stop learning’ day at Green and Gorgeous ( www.greenandgorgeousflowers.co.uk), where the superb Rachel Siegfried inspired us to grow more flowers and the Madonna of the urn Jo Flowers treated us to a floral ballet – complete with shafts of perfect sunlight. This year’s April inspiration came from a place. A place where wisteria meets terracotta and sunshine. 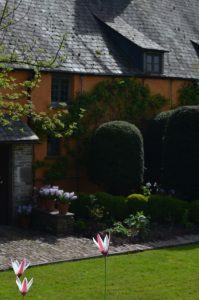 The breathtakingly beautiful garden created by Arne Maynard at his medieval Welsh home Allt-y-Bela (www.arnemaynard.com). 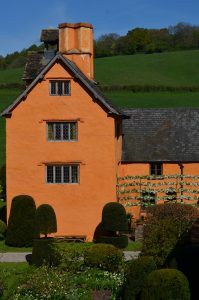 Along with Elizabeth von Grundy (our Instagram flower fettling friend) we took a two-day road trip through the gently undulating Welsh countryside, where the only relief from emerald green is the tiny clouds of white sheep. 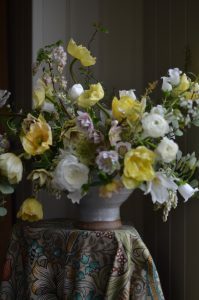 With Agatha Christie as our background music, we spent two memorable days soaked in sunshine, wisteria and, dare I say, several artisan gins on our Thelma and Louise meets Lottie Wilkins and Rose Arbuthnot trip away. 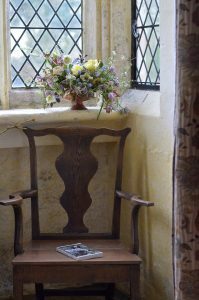 Listening to Arne Maynard talk about a “sense of place” and how he created his garden at Allt-y -Bela so that it sits in perfect harmony with the surrounding landscape, I couldn’t help but reflect on how we have a similar philosophy in our floral design work. Everything we do starts with a site visit and a desire to put the flowers, vessels and installations into areas where they seem right. 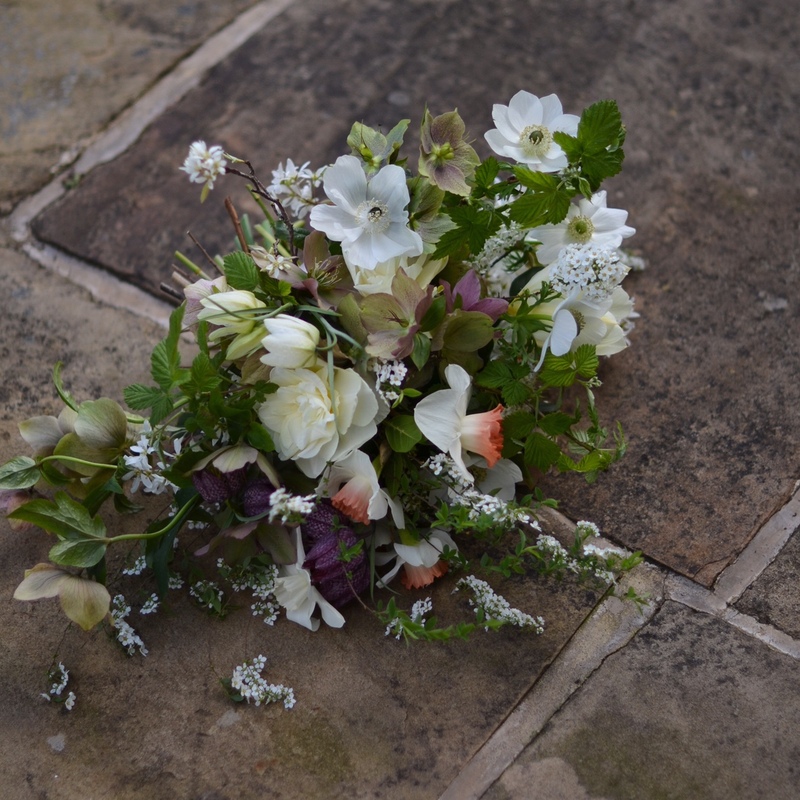 For us flowers are the accents to a memorable day but the leading ladies are always the brides. 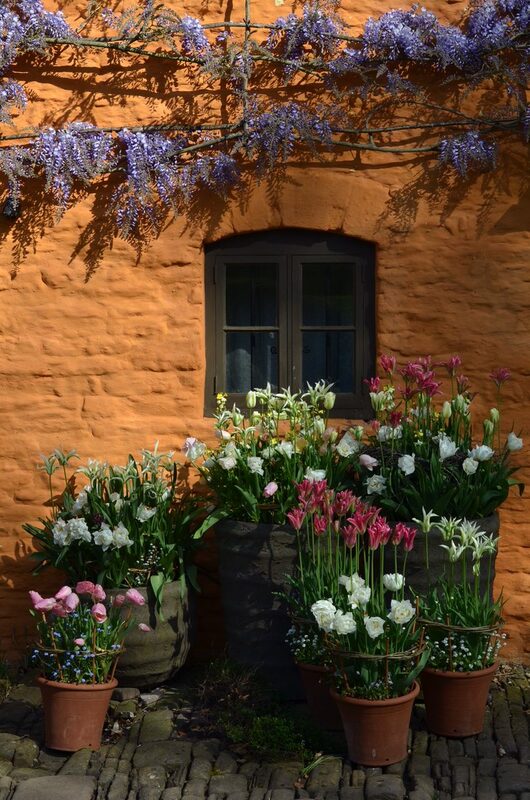 Where Arne has a bejewelled courtyard just outside his window, a place where all his favourite plants sit for him to see them easily each day, I have at home a large kitchen windowsill for my own cornucopia of floral treasure. 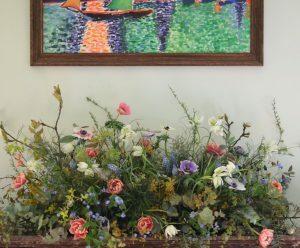 Floral design aside, I came away from that day with ideas of transforming some areas of our garden, nothing too drastic but over time I’ll make small changes to some of the spaces and our regular visitors might see new places where their works of floral art can be placed. First up – a dry stone wall around the compost heap! And now I feel that the scene has well and truly been set for the year. For us it will be a year of taking our classes to another level. 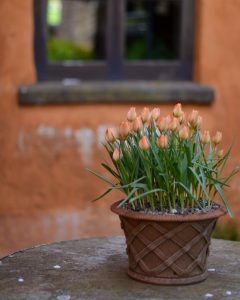 Many of our guests return and become engrossed; not just in the art of designing with flowers but in the art ( I’ll call it art) of growing them too. 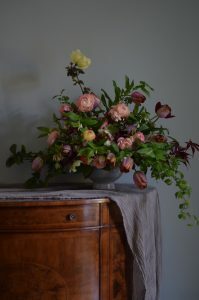 At the forefront of my mind each time I make an arrangement is the idea that it should look as if growing naturally – hence our use of seasonal flowers. I genuinely believe that if you grow flowers yourself you have a much better understanding when it comes to design work, and so this year some of our courses will also teach the art of growing and the appreciation of the garden. We are thrilled that we will be joined again by garden writer Louise Curley in summer and early autumn. 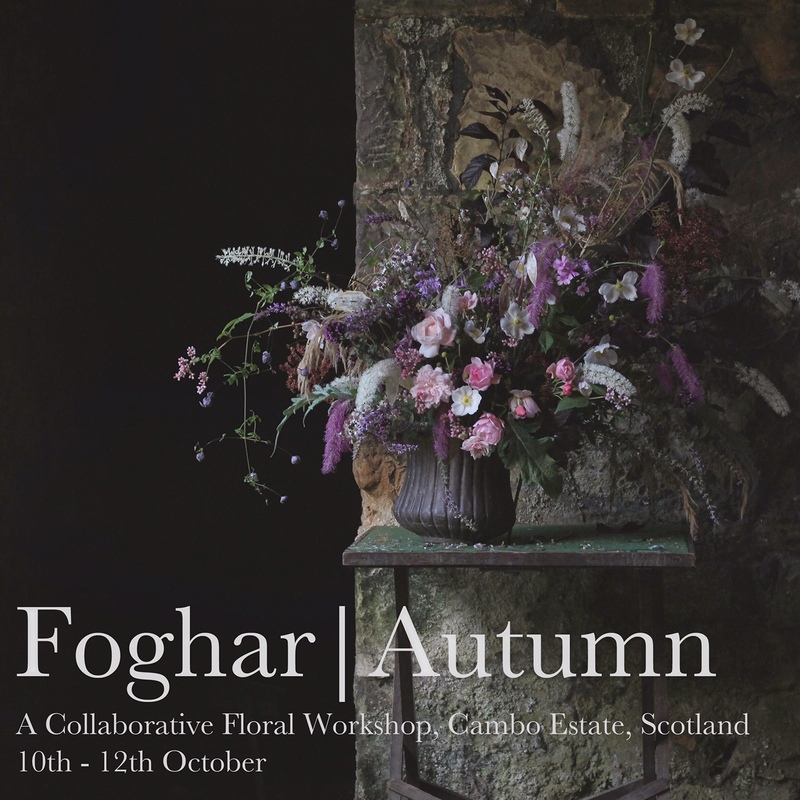 In May we have two days with gallery owner and allotmenteer Ed Chadwick of Snug Gallery. 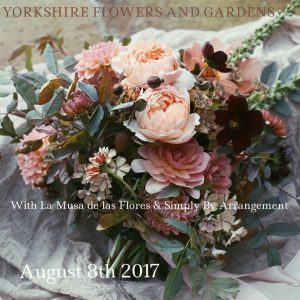 August sees the return of the supremely talented Gabriela of La Musa de las Flores. 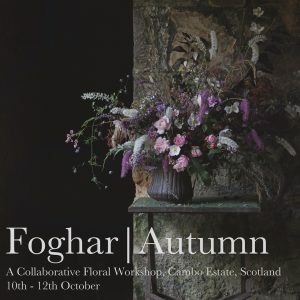 And we will end the growing season with a retreat on the Cambo Estate in Scotland, where alongside Christin Geall (www.cultivatedbychristin.com) and Rachael Scott (www.hedgerowflorist.com) we will entertain those who appreciate gardens and flowers in the soft light of a Gaelic autumn.